Dentigerous cysts are the odontogenic cysts which enclose the crown and are attached to the neck of an unerupted tooth.,, An inflammatory dentigerous cyst arises due to the progressing periapical inflammation from the root apex of the deciduous tooth around an unerupted permanent tooth. It usually occurs between 6 and 12 years of age and is ten folds more likely to occur in the lower jaw than the upper jaw. The incidence of inflammatory dentigerous cysts is twice as high in male patients as compared to female counterparts. In most of the cases, the dentigerous cyst is an asymptomatic entity, unless there is acute inflammatory exacerbation. If the cyst reaches a large size (>2 cm in diameter), swelling, mild sensitivity, tooth mobility, and displacement may be observed. The two main established treatment modalities of treating a dentigerous cyst are enucleation and marsupialization. Enucleation of the cyst together with the removal of the involved tooth rarely results in lesion recurrence. Excision is indicated when there is no likelihood of damaging anatomic structures, such as apices of vital teeth, the maxillary sinus, or inferior alveolar nerve. However, it is a very radical approach. Management of dentigerous cysts in primary dentition necessitates special consideration due to the preservation of developing permanent tooth buds. More conservative management consists of cyst marsupialization, which maintains the impacted tooth in the cystic cavity and promotes its eruption. 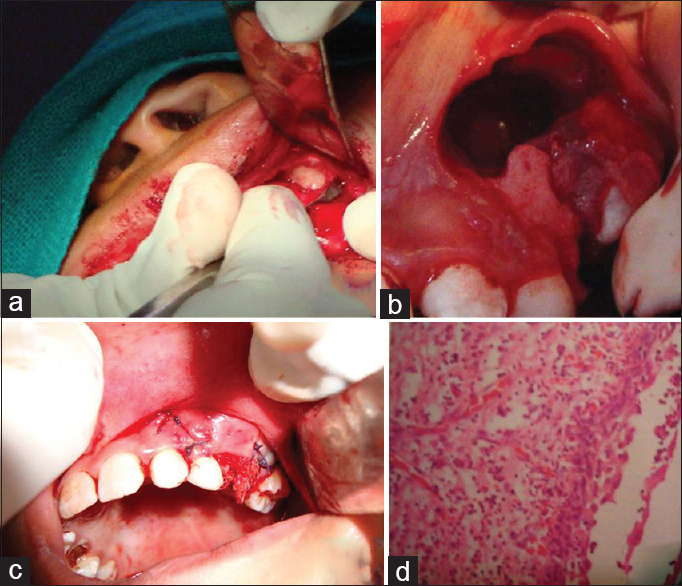 This article reports the spontaneous eruption of a canine after marsupialization of an infected dentigerous cyst and extraction of the deciduous teeth. An 11-year-old boy reported with the chief complaint of swelling in the left upper back tooth region. Clinical history revealed that the swelling started as a small nodule that increased to the present size over a period of 3 months. Painful symptomatology, paresthesia, or any pus discharge were not reported by the patient. Extraoral examination revealed hard firm, nontender swelling present on the left cheek region of the mandible [Figure 1]a.
Intraoral examination revealed a diffuse swelling of firm consistency, causing obliteration of the labial vestibule in 63, 64, and 65 tooth area [Figure 1]b. The deciduous left maxillary first and second molars were found to be cariously involved [Figure 1]c. Overlying mucosa was stretched. On palpation, the expansion of the cortical bone was found. The swelling was nontender, fluctuant, noncompressible, and nonreducible. Radiographic examination showed a unilocular radiolucent lesion 1.8 cm in diameter, having well-defined margins and extending from the mesial root of the deciduous left first molar to the distal aspect of the root of the left lateral incisor and surrounding the crown of the permanent left maxillary canine [Figure 1]d. Histopathologic examination of the aspiration biopsy showed a cystic lesion, and presumptive diagnosis of the dentigerous cyst was made. A complete medical history and blood investigation were carried out to exclude any systemic contraindication of surgery. Marsupialization was chosen as the treatment of choice to spare the unerupted permanent tooth buds. Under local anesthesia, the patient was treated by extraction of the left deciduous first and second deciduous molars and marsupialization of the cystic cavity. The procedure involved reflection of the flap along with the thinned-out bone [Figure 2]a. The contents of the cyst were evacuated, and irrigation was done to remove any residual fragments and debris [Figure 2]b. The cavity was packed with the iodoform gauze [Figure 2]c. The removed surgical specimen on histopathological examination confirmed the diagnosis of the dentigerous cyst [Figure 2]d.
A removable acrylic template was fabricated over the defected area to facilitate unhampered healing [Figure 3]a. The patient was recalled after 7 days for the change of dressing to allow decompression and eruption of the teeth. The patient was recalled periodically for clinical and radiographic examinations every 6 months, and reduction of the radiolucent area was observed during the course of time [Figure 3]b. A 13-month follow-up visit showed the eruption of first and second premolars [Figure 3]c. After a period of 18 months, permanent canine eruption was noted, without orthodontic traction or any other therapy [Figure 3]d.
Dentigerous cysts are the odontogenic cysts that are usually associated with an embedded or unerupted tooth.,, There are different theories that describe the etiology of the dentigerous cyst. The first theory advocates that it evolves from the fluid accumulation between the reduced enamel epithelium and the crown of the permanent tooth germ., These developmental dentigerous cysts typically occur in the late second and third decades, are discovered on routine radiography, and predominantly involve mandibular third molars. The second theory suggests that, along with its eruption path, the immature permanent tooth encounters a radicular cyst originating from its primary predecessor. This is the least accepted hypothesis because radicular cysts rarely develop in association with the primary teeth. According to the third theory, the dentigerous cyst is inflammatory in origin and occurs in immature permanent tooth as a result of inflammation from a nonvital deciduous predecessor tooth., The inflammatory dentigerous cyst is diagnosed in the first and early part of the second decade either on routine radiographic examination or when the patient complains of swelling and pain. The dentigerous cyst in our case report was of inflammatory origin. The dentigerous cyst can attain a considerable size with minimal or no symptoms and often block the eruption of teeth, displace teeth, destroy the bone, and encroach on vital structures such as maxillary sinus or alveolar nerve and may occasionally lead to pathologic fracture. Moreover, the epithelial cells lining the lumen of the dentigerous cyst unlike that of other odontogenic cysts possess an unusual ability to undergo neoplastic transformation to nonodontogenic malignances like squamous-cell carcinoma and mucoepidermoid carcinoma and odontogenic tumors like ameloblastoma and adenomatoid odontogenic tumor. Thus, an early detection and removal of the dentigerous cyst is important. Motamedi and Talesh stated that the choice of the therapeutic approach for treating a dentigerous cyst should be based on the size and location of the cyst, patient age, affected dentition, and relationship with the surrounding vital structures. Marsupialization being a conservative intervention is the treatment of choice to preserve the developing permanent tooth buds associated with the cystic lesion and is especially indicated for the growing children and adolescents. Marsupialization involves the creation of a surgical window in the cyst lining and evacuation of the cystic lesion contents while maintaining the continuity between the cyst and the oral cavity. This procedure stimulates a new bone formation by relieving the intracystic pressure and allows the spontaneous eruption of the unerupted/impacted tooth.,, Miyawaki et al. reported that an impacted tooth can erupt faster if marsupialization is performed at a time when the tooth can erupt. In the case reported here, marsupialization was the treatment of choice because the patient was a young child, and the cystic lesion occupied a large maxillary area. Orthodontic traction of the impacted tooth with matured roots has often been performed after marsupialization of a large cyst. In the present case, however, all teeth erupted with marsupialization only without orthodontic traction. Since the dentigerous cysts are usually asymptomatic and can attain a considerable size with minimal or no symptoms, early clinical and radiographic detection is important so that initial treatment strategies will prevent or decrease the morbidity associated with the same. The successful outcomes attained in this case report show that, with proper case selection, marsupialization might be a good treatment option for conservative management of dentigerous cysts. Neville BW, Damm DD, Allen CM, Bouquot JE. Odontogenic cysts and tumors. In: Neville BW. Oral and Maxillofacial Pathology. 2nd ed. Philadelphia, PA: W.B. Saunders; 2002. p. 589-642. 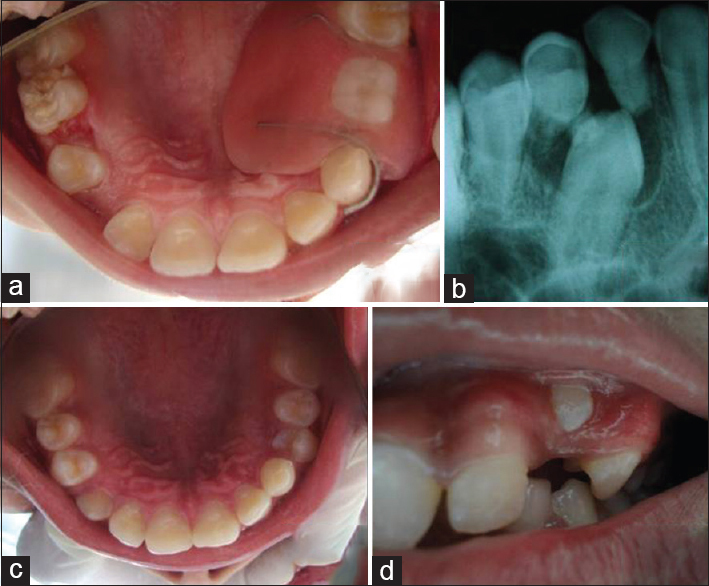 Martínez-Pérez D, Varela-Morales M. Conservative treatment of dentigerous cysts in children: A report of 4 cases. J Oral Maxillofac Surg 2001;59:331-3. Ertas U, Yavuz MS. Interesting eruption of 4 teeth associated with a large dentigerous cyst in mandible by only marsupialization. J Oral Maxillofac Surg 2003;61:728-30. Kozelj V, Sotosek B. 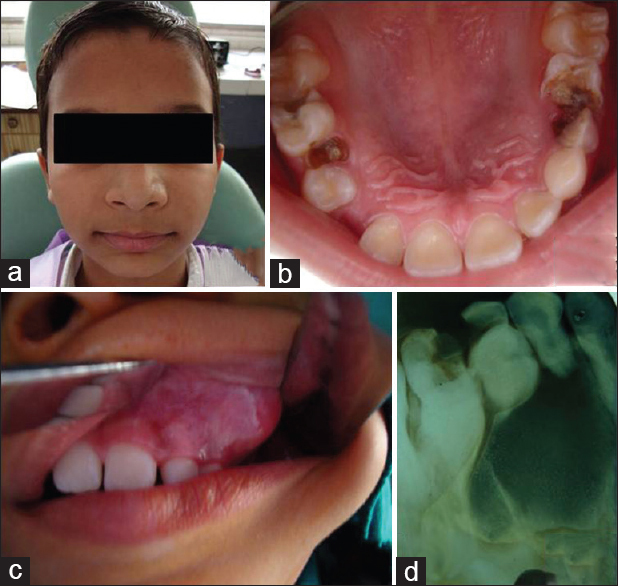 Inflammatory dentigerous cysts of children treated by tooth extraction and decompression – report of four cases. Br Dent J 1999;187:587-90. Delbem AC, Cunha RF, Afonso RL, Bianco KG, Idem AP. Dentigerous cysts in primary dentition: Report of 2 cases. Pediatr Dent 2006;28:269-72. Desai RS, Vanaki SS, Puranik RS, Tegginamani AS. Dentigerous cyst associated with permanent central incisor: A rare entity. J Indian Soc Pedod Prev Dent 2005;23:49-50. Smith G. Two dentigerous cysts in the mandible of one patient. Case report. Aust Dent J 1996;41:291-3. Miyawaki S, Hyomoto M, Tsubouchi J, Kirita T, Sugimura M. Eruption speed and rate of angulation change of a cyst-associated mandibular second premolar after marsupialization of a dentigerous cyst. Am J Orthod Dentofacial Orthop 1999;116:578-84. Thoma KH. Oral Surgery. 5th ed. St. Louis, Mo. : Mosby Co.; 1969. p. 891-904. Harris M, Toller P. The pathogenesis of dental cysts. Br Med Bull 1975;31:159-63. Benn A, Altini M. Dentigerous cysts of inflammatory origin. A clinicopathologic study. Oral Surg Oral Med Oral Pathol Oral Radiol Endod 1996;81:203-9. Mintz S, Allard M, Nour R. Extraoral removal of mandibular odontogenic dentigerous cysts: A report of 2 cases. J Oral Maxillofac Surg 2001;59:1094-6. Slootweg PJ. Carcinoma arising from reduced enamel epithelium. J Oral Pathol 1987;16:479-82. Moro Antonio JM, Puente M. Surgical-orthodontic treatment of an impacted canine with a dentigerous cyst. J Clin Orthod 2001;35:491-3.